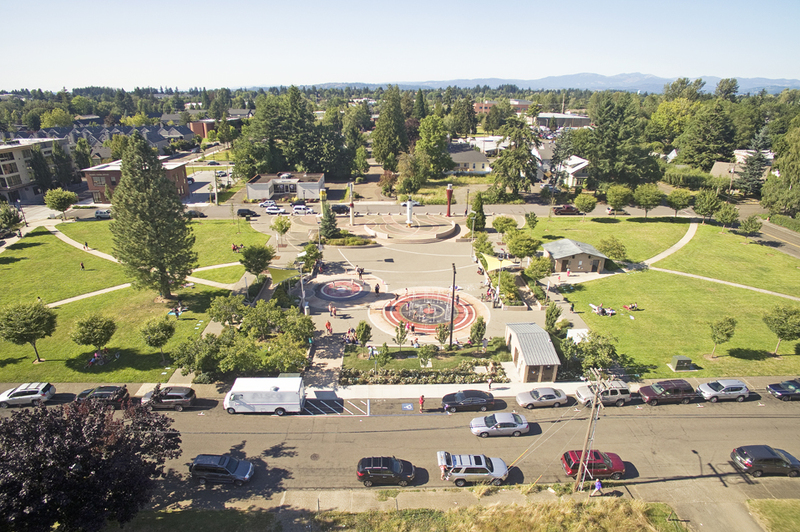 To stimulate economic activity downtown and enhance the public spaces in the Hermiston Urban Renewal District, the City of Hermiston identified development of a downtown festival street as a crucial factor in encouraging a more vibrant downtown. The festival street, planned for the existing right-of-way along NE 2nd Street will allow flexibility for programmed events throughout the year and will open to traffic when not in use. Additionally, the need to create a gateway into the downtown has also been identified as an opportunity to create a safer intersection. These improvements will serve economic development goals and provide a sense of arrival and place in Downtown Hermiston. GreenWorks collaborated with Atelier Dreiseitl of Germany to design Tanner Springs Park, an urban park in Portland’s Pearl District. Envisioned as an urban park with a wetland focus, the park serves the developing surrounding neighborhood as well as visitors to the area. 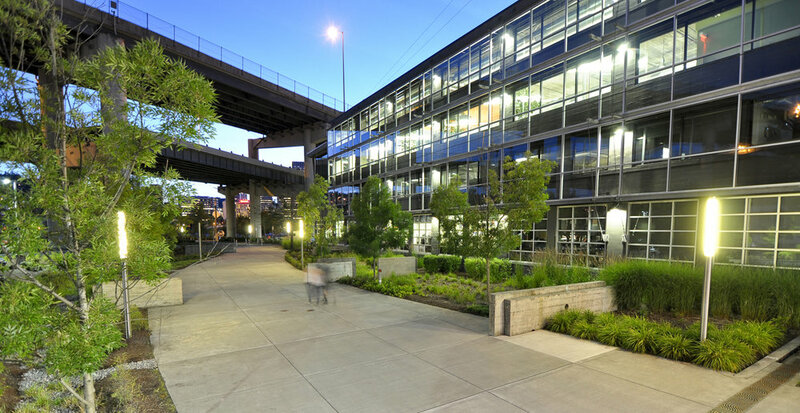 The sustainable design features innovative uses of water and stormwater, creating a refuge for people and wildlife in the midst of this bustling downtown neighborhood. The design process was highly interactive involving the citizens of Portland through a series of public workshops. Located at the intersection of NW Overton and 9th Street in the heart of the Pearl District, this site is home to a 15-story condominium residential tower. 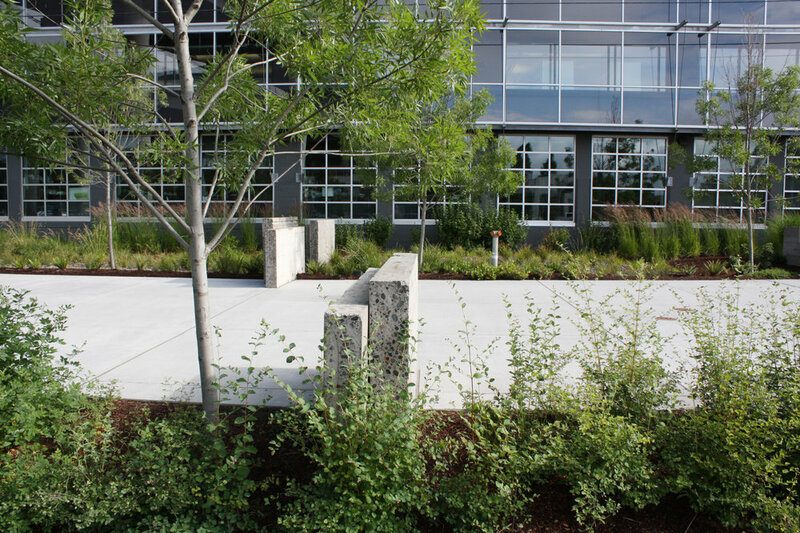 GreenWorks was hired to provide landscape architectural elements for the development parcel, and adjacent public properties. GreenWorks designed a dramatic entry plaza, park lane, enhanced pedestrian areas, and a viewing garden that will be energized by stomwater runoff flowing over recycled glass. This project is targeting LEED Silver achievement. GreenWorks was responsible for a number of sustainable strategies for the Béranger Condominiums. The ecoroof project, the first in the City of Gresham, included 3,000 s.f. of extensive vegetated rooftop area. 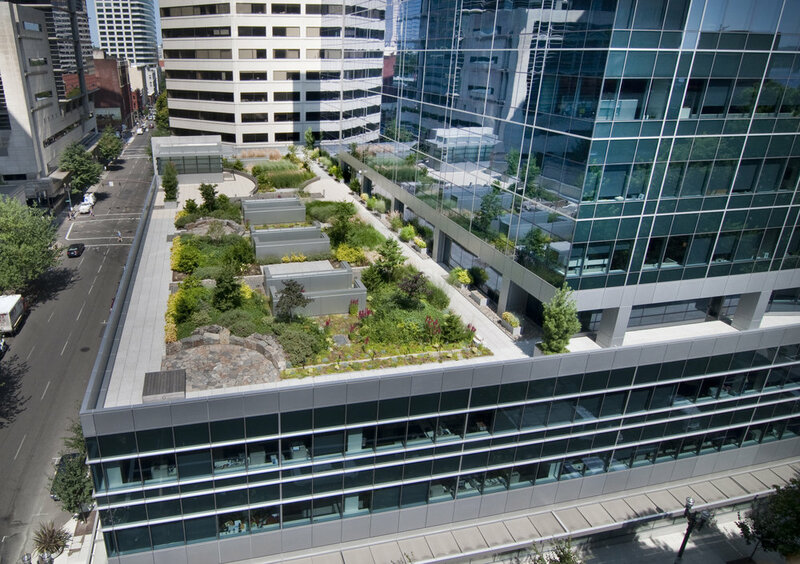 In addition, the project included using rooftop flow-through planters in tandem with the ecoroof for an integrated stormwater strategy that manages all of the building run-off prior to it reaching the ground. This minimized cost and maximized useable open space. Amenity areas were included, with a 1000 s.f. rooftop plaza for residents using raised pedestal paver systems, and incorporating seasonal plantings. The overall design provides stormwater management that is functional, serves as an amenity for residents, and is helpful as a marketing tool for attracting prospective buyers. This project implemented a high-priority project identified in the Pendleton Court Avenue/River Parkway Master Plan prepared by Greenworks. 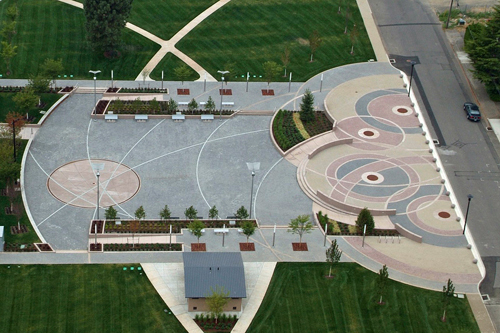 The goal of this project was to create a meaningful gateway at the Westgate entrance to downtown Pendleton. The previous conditions at the Westgate Intersection were a confusion of unsafe vehicle traffic circulation, a multitude of cluttered overhaul utilities and barren landscape slants. The City of Pendleton and ODOT reconfigured the intersection to provide safer traffic movements and reduced utility pole/lightpole clutter to create a simpler and safer intersection solution. Russellville Commons, located adjacent to the TriMet MAX stop at E Burnside and SE 102nd Avenue, is a three- to four-story assisted living facility with group care units for Alzheimer patients built atop an underground parking garage. 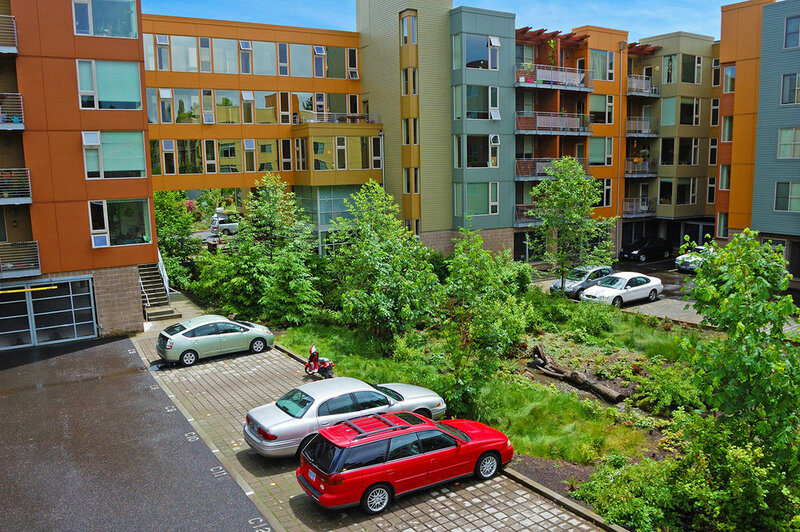 It is one of the first multi-family developments in Portland’s Gateway District, part of the 1996 Outer Southeast Communtiy Plan’s densification initiative. GreenWorks is designing streetscape improvements for Phase III, as well as an interior courtyard space that includes a memory care courtyard and a fountain. 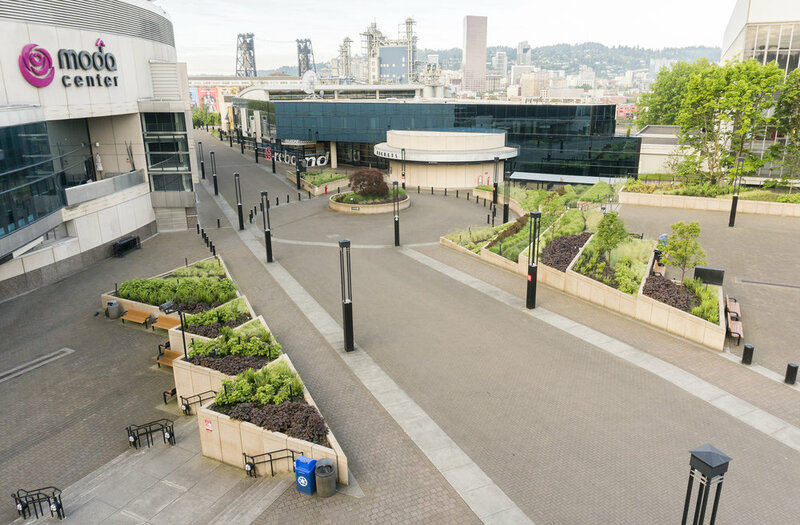 Significant streetscape elements include flow through planters that manage the building’s roof runoff along E Burnside and SE Ankeny Streets, and an entry plaza with special paving along and across SE 103rd Avenue extending to the Phase II section of the project. The interior courtyard space includes sculptural walls that provide a variety of spaces for individuals and for group interaction, as well as a tree-covered outdoor dining area. 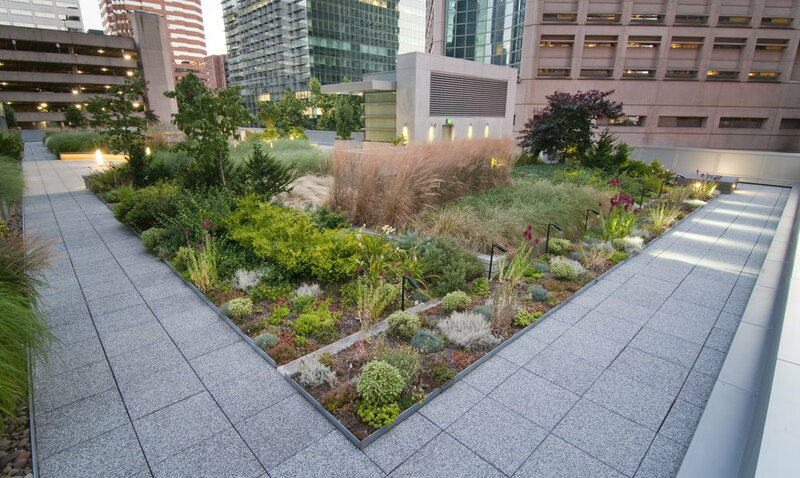 A circular vegetated swale handles courtyard stormwater runoff and provides a central landscape feature that echoes notions of healing and tranquility for the building’s residents.